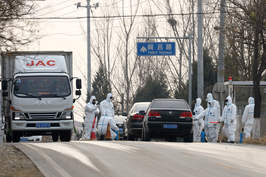 The number of pigs culled in efforts to fight China’s swine fever outbreak is approaching one million, according to a statement from China’s Ministry of Agriculture and Rural Affairs released on Tuesday. “Through January 14, 2019, there have been cases of the epidemic in pigs and wild boars in 24 provinces, and a total of 916,000 pigs have been culled,” the statement from ministry spokesman Guang Defu read. The statement did not put a figure on how many pigs have died from the disease. The ministry also released text of a question-and-answer session between reporters and unnamed agricultural ministry officials handling animal husbandry and veterinary practices. The session focused on the spread of swine fever through the use of pigs’ blood as raw material in animal feed. In late December, the General Administration of Customs issued a warning (link in Chinese) after the swine fever virus was found in hemoglobin powder for pig feed, made using pork blood sourced from a slaughterhouse in Tianjin. The finding came months after China banned the use of food waste and pig blood in the production of pigs feed. However, the officials said research done by the Chinese Academy of Agricultural Sciences found that the risk of transmission through blood products was slim. Such products were unlikely to contain the live virus, the officials said. “No cases of African swine fever being spread through commercial feed containing raw materials made from pigs’ blood have been found,” they said. The African swine fever virus was first reported in Shenyang, the capital of Northeast China’s Liaoning province, in August and has emerged in a scattered pattern across the country. The virus is not harmful to humans but is deadly for pigs. 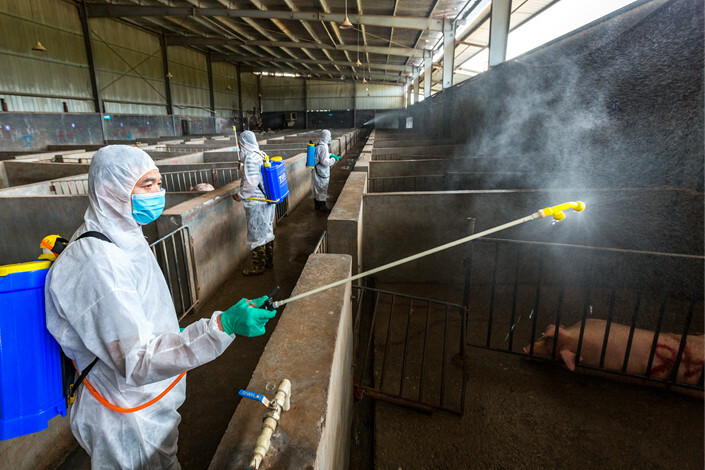 There is no cure or vaccine, which means the most effective means of controlling outbreaks is to cull pigs that may have been exposed to the virus. Yet outbreaks continue to spread throughout the world’s largest consumer and producer of pork. The Chinese government has said it has implemented strict measures to control the spread of the disease and has blamed “lawless elements” such as unhygienic transportation of pigs or farmers who continued to sell sick pigs without reporting cases. In the statement, Guang said his ministry had been timely, open, and transparent in its release of information about the virus. However, analysts are expecting the outbreak to have major effects on China’s pork market and related industries. Restrictions to stop the spread — which includes banning the transport of live pigs outside affected provinces — have stymied sales of pigs around the country, and many farmers who have managed to sell off their stock or have had their animals slaughtered may not restock. This year, China may have to rely more heavily on imported pork to meet demand. The virus has also contributed to China’s slowing import of soybeans, a major ingredient in pig feed, a market analyst from the state-owned China Grain Reserves Corp. told Caixin (link in Chinese). The southern special administrative regions of Hong Kong and Macau have been on high alert since the virus was found in the mainland city of Zhuhai only 37 miles from Hong Kong. Taiwan has implemented a temporary ban on the import of pork products from Kinmen, an island less than one mile from the Chinese mainland, after a dead pig that tested positive for the virus washed up on the island’s shores earlier this month.